As any dog will gladly tell you, George Washington Carver was onto a very good thing! 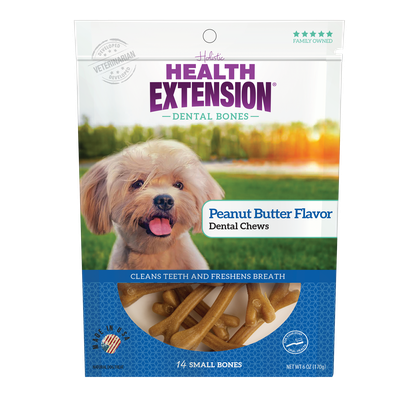 Our Peanut Butter Dental Bones are formulated with kelp and parsley to naturally freshen breath, while their special texture helps scrub plaque away with every bite. Plus, these super-tasty bones are packed with antioxidants, vitamins, minerals and essential amino acids like all Health Extension pet foods and treats. Large dental chews for dogs 6lbs and up, feed 1-2 per day. Not a complete and balanced meal. Always supply fresh water. Medium dental chews for dogs 5lbs and up, feed 1-2 per day. Not a complete and balanced meal. Always supply fresh water.Small dental chews for dogs 4lbs and up, feed 1-2 per day. Not a complete and balanced meal. Always supply fresh water.